A perfect marketing strategy helps in getting great results for your company and gets you more customers. VTel.in provides efficient marketing strategies by using amazing technology. 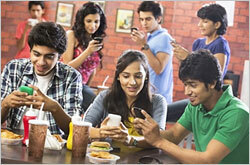 Their bulk SMS Delhi service is a user-friendly and economical marketing solution. Unlike traditional modes of marketing, bulk SMS marketing requires very little human support as it makes use of the ever advancing technologies. We offer bulk SMS services in Delhi, which not only involves sending messages but also adding and editing contacts, composing messages and so on. We are known for our high quality marketing services, which we offer at affordable rates. The SMS tool is very quick and effective. You will be able to send messages to as many as 10000 mobile users at a time. You will also be able to send as many messages in a day as per your requirement. The bulk SMS Delhi gateway ensures that your messages are delivered to the users of both CDMA and GSM technologies. These unique features help in boosting up your marketing campaign.